Whether you have a whole room devoted to sewing, or whether your stuff is stashed behind the bedroom door, lots of us often find ourselves with same problem. We find ourselves craft hoarding and It takes over. The fabric pile becomes a mountain. The mountain expands and spawns more mountains. Drawers become full of stuff and boxes overflow. Chairs and tables become buried under half finished projects. Cupboards become so full we dare not open the door in case we release a vicious monster made from Amy Butler fabric squares, stray bits of elastic and selvedges we kept because somebody told us we shouldn’t throw them out. Some people need tidiness to be creative, but some of us find that our creativity flourishes in a mess. However this is no good if you can’t get near your sewing machine because your craft hoarding tendencies mean your overflowing yarn basket is blocking the way! So what can we can do to control the craft hoarding and stop the mess from taking over? 1. Invest in some storage. It doesn’t need to be fancy or expensive! My fabric hoard lives in these boxes . They’re not pretty and it does make my bedroom feel a little bit like a storage facility, but it’s better than having a pile and at least it’s contained. I also have some small plastic boxes that I use to store ribbon and other bits and pieces. If you don’t have much of a budget for this kind of thing, there are plenty of things you can use for free. I use a large cardboard box covered in wrapping paper. Jam jars and shoe boxes are also good for storing things. 2. If it’s really bad, you might have to take some time to have a major sort out. If you’ve been craft hoarding for a while, a mess has probably been building up over time. It can be intimidating to tackle a messy room, but even a messy corner can be off putting, especially if organising stuff is really not your thing. So here’s a tip from the FlyLady: Take 15 minutes every day to have a go at it until it’s done. 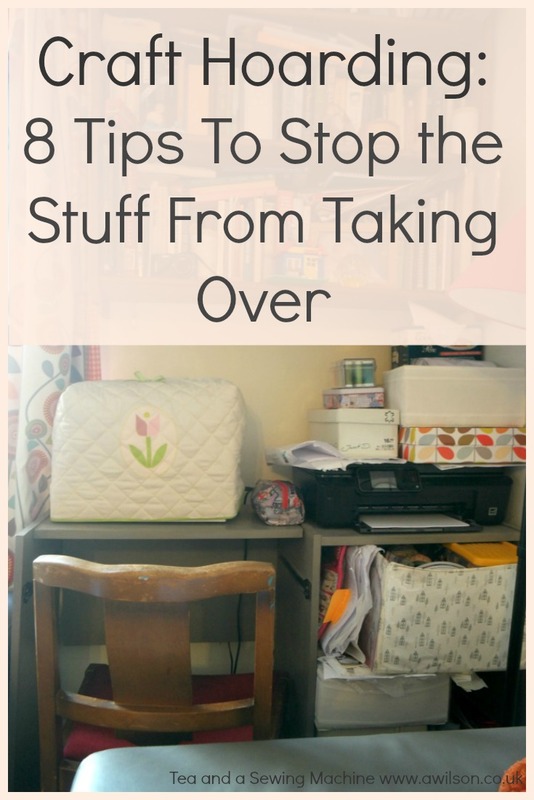 Keeping things tidyish is much easier than getting the stuff under control in the first place, so once things are sorted it will be easier to keep it that way. 3. Get rid of stuff you’re not going to use. This might be difficult, especially if you tend to be a bit of a hoarder generally. Be strict with yourself and answer honestly. Am I going to use this? If the answer is no, then get rid of it. This doesn’t necessarily mean throwing it away! Maybe you have a friend or family member who would like it. Old people’s homes and community centres can often use craft supplies too. 4. Try not to buy more stuff until you’ve used up at least some of what you have. If you have a sort out, you might find that you have things that you’ve forgotten about. I found some magnetic snaps the other day after I’d bought some more because I thought I’d run out! If you’re able to keep things organised, you’ll know what you have. If you have lots of fabric, plan some scrap projects and decide what you are going to make with any larger pieces you might have. I know sometimes it’s difficult to cut into something that’s especially beautiful, but if you make something with it, at least it will be used and you’ll probably see it more. You’re not going to see it if it’s buried in a box or in a fabric mountain behind the bedroom door. 5. Avoid your favourite fabric shops. If you have issues with walking out of a fabric shop empty handed, maybe it’s best to avoid them for a bit until you get things under control. 6. Don’t buy anything on a whim. Have a project in mind for it first! This isn’t foolproof. You actually have to make the thing. But at least you won’t be adding to a pile of fabric that you like but don’t know what to do with. 7. Make some gifts for people. Now is a good time of year to be doing this with Christmas coming up. Alternatively, you could make some stuff as birthday presents or as gifts for your child’s teachers. Also there are various charities that you can make things for. Dress a Girl Around the World is a charity that distributes dresses to girls and shorts to little boys in the developing world. 8. Open a shop on Etsy or get a stall at a craft fair. This way you’ll be able to recoup the cost of some of the stuff that you’ve bought! Just a word of warning: selling on Etsy takes some research if you want it to be a success. You’ll also find that some craft fairs are better than others, and you will need to pay a fee to sell at them. Do you have any more suggestions for keeping the craft mess at bay? Add them in the comments! And if you want to make a start on getting organised, I have a couple of free printables. One is for keeping track of your fabric, the other is for making a list of haberdashery bits and pieces you have. You can have them for free in exchange for an email address, just fill in the form below.